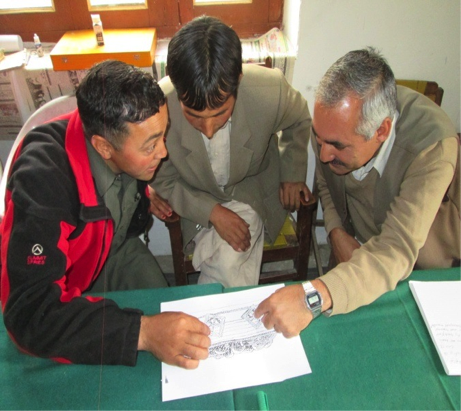 Iqra Fund routinely sets up and meets with the Village Education Committees (VECs) in the areas that we work. These VECs are made up of fathers, elders, and community leaders, all of whom are excited about and committed to quality education for their children, especially their daughters. Each VEC receives training on their roles and responsibilities, the role of parents in a child’s development, and the importance of volunteerism. VECs are one of the most important stakeholders of our communities. Community participation and support from each local VEC has enabled us to get more and more children in school, and swiftly resolve day to day issues that arise in managing and running the schools. Recently, the Village Education Committee (VEC) of Mashabrum Public School in Hushe Valley met a target goal from their School Development Plan: renovating the school latrine on a self-help basis. Well-maintained latrines remain crucial to education, particularly for girls. According to UNICEF, girls are encouraged to continue their education if they have safe, clean facilities available and also will remain healthy to fully participate in school. With clean latrines, girls can also learn about healthy hygienic processes and general well being, knowledge that they can pass onto their families. Hushe Valley is one of the most remote valleys of the Ganche region of Gilgit-Baltistan, and Mashabrum Public School is situated several kilometers away from the town of Skardu. Despite its remote location and lack of immediate access to resources, the community members came together and contributed however possible to the renovation. VECs remain committed to their main responsibility of ensuring that all school aged children are enrolled in school, a goal that we also share and are working hard to achieve.